The vibrant, exciting, historical, and chaotic nature of Bangkok are what attract so many visitors every year. Of course, the cheap prices help, too. Bangkok makes an ideal tropical destination for excitement, romance, nightlife, and music. Visitors from around the world flock to the land of smiles to take everything in, including the hot streets along the river to the old temples to the exotic nightlife. Each of Bangkok's neighborhoods may have something unique to offer, but they all have one thing in common: a great time. The party hostel options listed below are not only great places to make a base as you see the surroundings, but are also good spots to make some new friends and have a great time with them. This recently opened hostel is located in the heart of activity in the city of Bangkok. It's near many of the most important must see attractions including the Grand Palace, Khao San Road, the Temple of Dawn, Wat Pho, the city's best nightlife and some of the more interesting shopping areas. The decor of the hostel is laid out in a Thai home style and there is a very fun and social atmosphere to the place. There are many different communal areas where guests can enjoy relaxing. The hostel strives to meet the high standards set forth by guests. There are many different amenities available and you are assured to have a comfortable bed, clean room, hot showers, and wi-fi internet access throughout the facility. Public transportation is also conveniently close by as well. The building is surrounded by gardens given it a lovely setting. Other amenities available to guests include lockers with locks, linens and towels, luggage storage, internet access, guidebooks and more. It's prime location make it a perfect option for visits who want to enjoy the vibrant nightlife and party scene that Bangkok is so famous for. With over 10,000 reviews and a 93% approval rating this is the highest rated party hostel group around. The party never stops here, and everyone is welcome to join in. If you are open to meeting people from all cultures and backgrounds, open to making new friends that could last a lifetime, and ready to make some of the best memories you've ever had, this is your place. If you are antisocial and are just looking for a bed to sleep in, this may not be the best option for you. This is a party hostel and there is a good chance you'll see people who are occasionally loud, drunk, and naked. They do not accept bookings from people over the age of 35. The facility offers the comfiest beds you'll find in Thailand, an amazing cafe and bar with all your Thai and Western favorites, multiple 1000 Mbps Wi-Fi connections, an amazing central Bangkok location only five minutes from the Skytrain and access to the entire city, nightly beer pong tournaments, and tour options that will let you see some of the best parts of Bangkok. Free parking, Wi-Fi, linens, and towels are included. Lub d Bangkok Silom is a friendly, spacious and clean hostel located near Chinatown and Bangkok's main train station. It features quite a few comfortable extras, such as laundry facilities, an onsite bar, a cozy cinema room and 24hr reception, served by staff who are always happy to help. If you're into shopping, exploring, partying and staying in the heart of Bangkok's busiest districts than Lub d Silom is where you need to be. The custom made common spaces make it easy to meet other backpackers inside and outside of the hostel. You can put your feet up in the theatre or grab a local beer from the famous Donut Bar, sit outside and watch Bangkok do its thing. The facility also has happy hours, breakfast available, and an activities schedule to keep you entertained while taking a break from seeing everything that Bangkok has to offer. Lub d Silom was picked as one of the coolest hostels to stay for backpackers according to The Observer UK and has received numerous other awards. Choose between mixed and ladies Dorms or spring for a more private experience with a twin or private room. Free city maps, Wi-Fi, and linens, and towels are included. 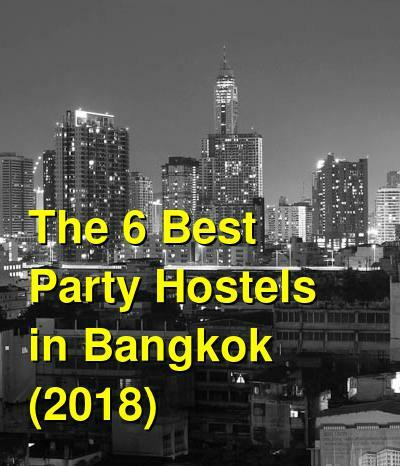 This hostel is in a good location for those who are hoping to do some partying along Khaosan Road or Silom, but still want to be a little removed during the night so they can be sure and get some sleep. The hostel is a cozy and clean place with a relaxing atmosphere. There is air conditioning available all day long in the rooms and you can be assured you will have access to a hot shower. There's a roof top deck that many guests use to hang out on and meet some new friends. From there you can enjoy nice views of the city's famous Lumphini Park. The stay works hard to assure that guests receive all the basics, including a clean room at a low price. This place is a good value for the money. There is also free wireless internet access throughout the property and there are public computers available for use by those who don't have their own laptops. You can get all kinds of travel information at the travel shop that is located on the ground floor. From there you can make any number of arrangements including plane, bus or train tickets.